I don't know about you but I'm not so great at keeping my promises. Let me explain. I think I'm at least average, if not above average, at keeping my promises to other people. My problem stems with me, really. I've promised to eat healthier and stop sneaking the gluten and dairy. I've promises to pursue my dreams. I've promises to walk more and couch potato less. I've promised to spend more time reading. I've promises to journal and carve out a space to listen to God more. You know what happens to all those promises? I dump them overboard because someone is asking me to do something else. Don't get me wrong. Sometimes the ask is important. Sometimes the ask is something I should commit to. Sometimes the ask is worth putting my promise to myself on hold. The reality is that promise may be a strange name for it, in your mind. It's really a commitment you're making to yourself to work on you. A promise or a commitment is a decision to invest in you. Who you are. Where you are going. And finding yourself in the middle of the expectations of your everyday life. I bring this up because I hadn't thought of this before. I've been running a little ragged lately. Keeping up with One Foot. Creating websites for my copywriting clients. Working a part-time job. And the running is taking it's toll. And then I read a book. Girl, Wash Your Face by Rachel Hollis. Actually, I'm still reading it. But she caught my attention in chapter 2. Stop keeping promises you make to everyone else and breaking the ones you make to yourself. I had to admit she had me there. All the frenzy. All the stress. All the becoming someone I'm not sure I liked anymore came from not keeping the promises I was making and needed to make for myself. The reality? We all have promises we're putting by the wayside. That dream you always thought you would accomplish. That achievement that you've put off until tomorrow again. The trip or experience you've been wanting to have with your spouse of kids. The job you knew you'd always enjoy. The healthy life and body that is waiting for your consistency. As I write today, I'm wondering about your own promises. I believe I'm not alone when it comes to making sure I keep the promises I make to others while putting myself on the bottom of the list. I put off exercise because I'm too busy. I put off times with God because I'm running late and need to be on time. I put off pursuing my dreams because it's easier to make money at a job than risking waiting on new clients. We all have them. Commitments we've swept under the run and forgotten about. A few is no big deal. But sweep too many away and soon we'll forget who we are and what God created us to do. Keeping our commitments help us remember our dreams and passions. Slowing down to embrace our commitments reminds us that God created us on purpose for a purpose. Slowing down to keep our promises reminds us that our value and worth are not tied to our doing but in our becoming. The typical blog formula is simple. Present the problem. Write about the steps to help the problem. But today, I don't have the answers. As I read Rachel's words, I had an ah-ha moment. You see, I hadn't really realized in those words that I was breaking promises to myself. I was just doing the next thing. The one that other person asked me to do or expected me to do. I've said this before. Our lives cannot be an endless list of yeses. Each of us have limited time. We can only say yes to so many things in a day. 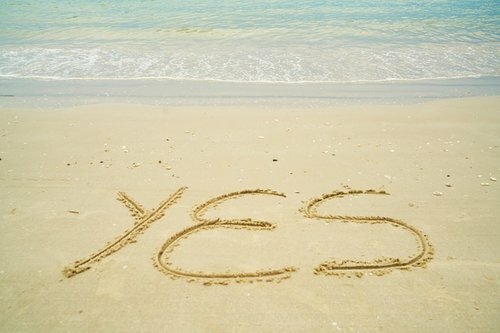 And every time we say yes to something, we are being forced to say no to something or someone else. If I say yes to a new project at work, I may be saying no to having the time to instill healthy habits like daily exercise, or serving at my church or on a nonprofit. Saying yes to someone else's needs may mean we need to say no to spending time with the people we love. Here's what I'm not saying. We can swing the pendulum the other way and only keep promises to ourselves. We become self absorbed. Every yes is about us. We can get caught up in making our world about us that we don't love and serve those we love. We may become someone who is not a team player. Or can't be counted on. I firmly believe there's a balance. Here's another thing I believe. If you're concerned about becoming selfish, it's a good sign that you are probably not selfish and could use a slowing down to keep a promise or two to yourself. Just saying. Getting started is always the hard part. First, you may want to identify the promises you've been breaking. Taking time for you. Sneaking your allergens (I won't be pointing any fingers). Putting other things above pursuing your dreams. And then, like we always talk about around here, take one baby step. It may not get you to keeping that promise fully, but maybe it gets you one step closer. Choosing to walk the dog daily to get a little exercise. Choosing to wake up early or stay up late to spend time with God. Choosing to read weekly to invest in you. I don't know what your promise is, but I know the keeping your promises to yourself can help you start becoming the woman that God has created you to be. And that, my friend, is what you and I can aspire to become. Hey there! I'd love to hear from you! Keeping promises to yourself is hard. I'd love to pray for you on the journey and hear about those promises you want to keep. Comment here or contact me directly.